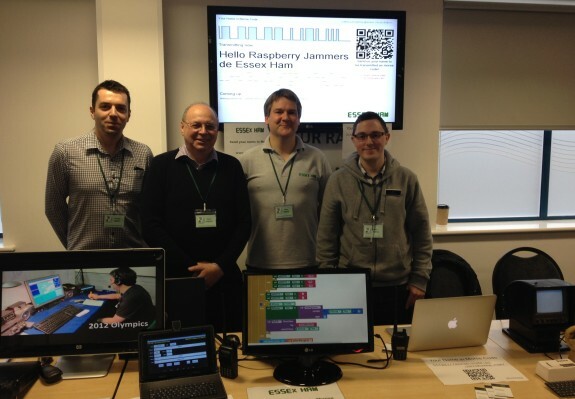 Essex Ham has spent the day at the November 2014 Raspberry Jam in Southend-on-Sea today, the 22nd of November 2014. Today was our first experience of this event – which was an informal meetup of people with a passion for open source technology, Linux coding, Arduinos and Raspberry Pis. 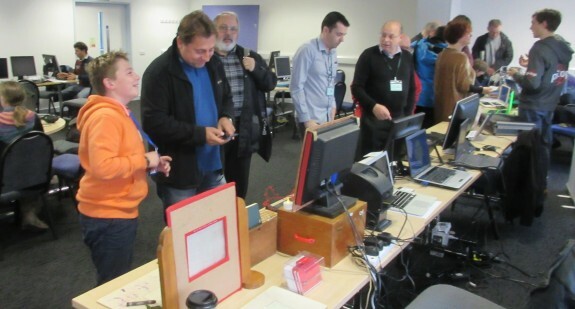 The event was hosted by the Southend Linux User Group, as the Tickfield Centre, close to Prittlewell Station in Southend, and was a great opportunity to demonstrate what amateur radio is all about to a large number of visitors with an interest in technology, computing and programming. This was a very busy event, full of a host of activities, show-and-tell demonstrations, as well as talks on a wide range of topics. There were plenty of tables, showing all sorts of things, such as 3D printers, create your own website, Android-controlled robots, Minecraft, construction, coding demos, games and wearable technology. 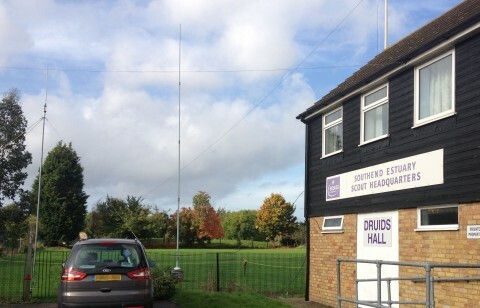 Manning the Essex Ham stand and talking to visitors during the day were Nick 2E0DVX, Pete M0PSX, Steve 2E0UEH and Charlie M0PZT. 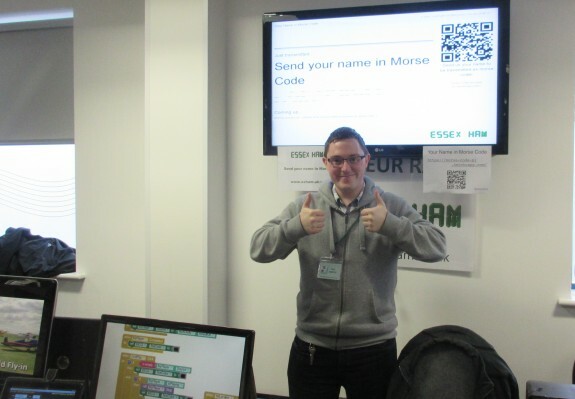 Demonstrations included a “Send your name via Morse” (more of this later), the SDR dongle running on SDR Sharp, a Yaesu FT857 (not radiating), a selection of handhelds, the Essex Ham “What is amateur radio?” video and logging on an Android tablet. A good selection of leaflets were on offer to those interested in taking up the hobby. 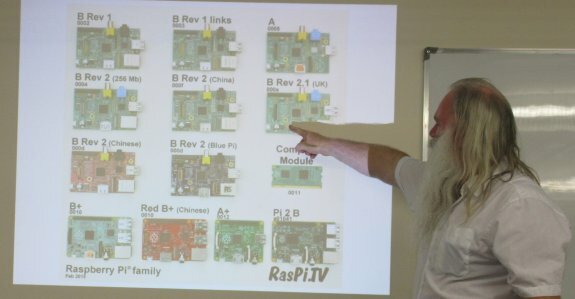 Several of the projects being worked on by Raspberry Pi developers have an overlap with amateur radio, meaning that those who visited us on the Essex Ham stand were genuinely interested in what we do, and asking some excellent questions. Some have an interest in high altitude balloons, and we’d suggested that our local HAB expert Chris M6EDF come along to help out and answer questions. Some of the work that Essex RAYNET is looking into regarding data networking and computing in low-power conditions has an overlap, and we were joined by RAYNET’s Gareth 2E0PSN. Ricky M6DII made the trip down to Grays to see what was going on too, and may just be persuaded to get started with a Raspberry Pi project, if and when he gets some spare time. 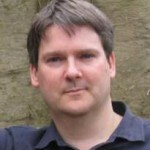 Our sincere thanks to Nick 2E0DVX – the star of the event. Overnight, Nick put together an awesome demonstration, which he completed at 3am ahead of a 9am on-site start. 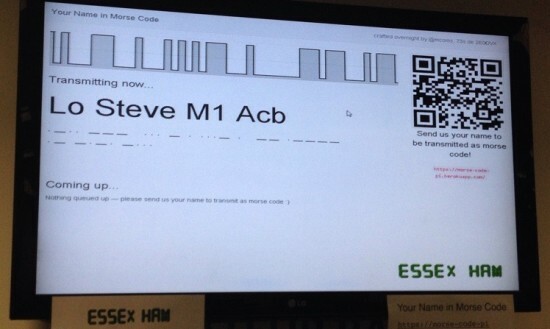 Visitors could send their name from their smartphones, wither by typing in an Essex Ham shortcode, or scanning a QR code, and the name would be displayed on a large screen, with a greeting being played back (with audio) in Morse code across the hall. As well as making this available to those visiting our stand, we tweeted the address, and received greetings from a number of amateurs not able to make it to the event, including: Steve M1ACB, Peter 2E0PTU, James 2E1GUA, Richard M0CLZ, Dorothy 2E0NCE, Steve M0SHQ, Phil GU0SUP, Jakub 2E0FTX, Les G6XJC, Dave M6ILM, Terry AK4, Mitchell 2E0EMO, and a few more – Your names and callsigns echoed through the hall in CW! Second prize (of a cup of show coffee) goes to Charlie M0PZT, for bringing along not only his Android tablet complete with custom-written logging application, but a short video presentation showing how it was put together – aimed at the day’s technical audience. 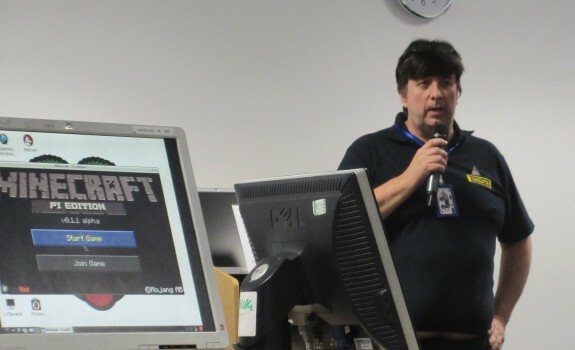 A regular at the CARS Skills Night with something Pi-flavoured, Peter G0DZB was at the Raspberry Jam, but not in an amateur radio capacity. 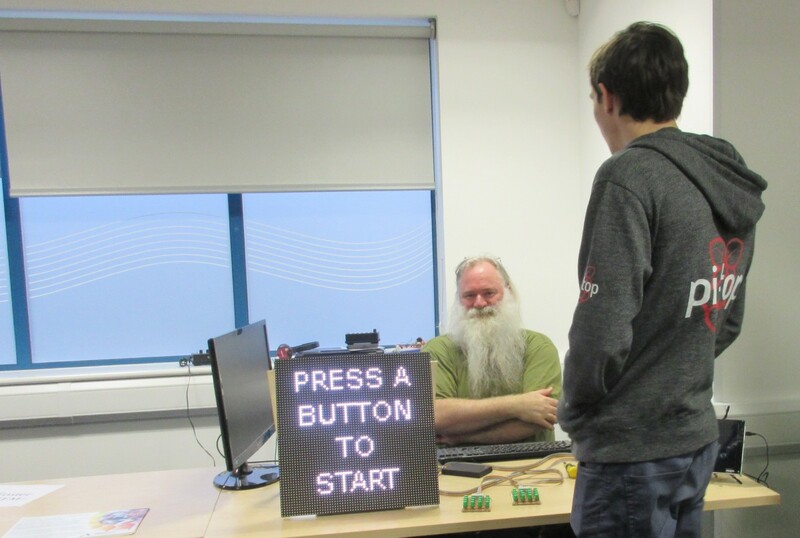 His impressive Raspberry-Pi driven 64×64 resolution dot matrix screen was grabbing the kids attention when running the Tetris game. Some of the bigger kids were hooked too – with Charlie M0PZT holding joint-first place with 7 points when we checked in at Peter’s stand. 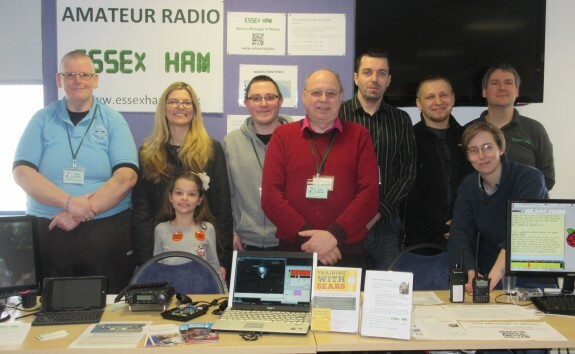 Thanks to all of Essex Ham members who helped out on the stand or came to help spread the word about amateur radio. 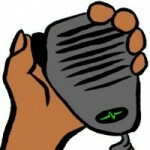 Hopefully, we’ve picked up a few new recruits! We’ve also picked up some good ideas for potential projects and tie-ups, which we’ll certainly be following up on – watch this space! A few more images and a couple of interviews will follow shortly, so keep your eye on the Essex Ham Facebook and Twitter feeds for more soon. Wish I had a chance to check this out more! It looked interesting, but there was so much going on on the day – hard to keep track of everything! Great event; flew by.